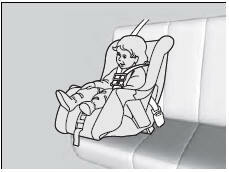 Placing a forward-facing child seat in the front seat can be hazardous, even with advanced front airbags that automatically turn the passenger’s front airbag off. A rear seat is the safest place for a child. Educate yourself about the laws and regulations regarding child seat use where you are driving, and follow the child seat manufacturer’s instructions.